International Journal of Comprehensive Research in Biological Sciences (IJCRBS) is a multidisciplinary peer reviewed, monthly and indexed open accessed International Journal dedicated to scientific research which aims to publish latest and outstanding research articles in all branches of biological science. IJCRBS’s mission is to provide a platform established with the aim of motivating the scientific community as authors, researchers, professionals, teachers and their students, assisting them to improve their knowledge. IJCRBS has an editorial policy of publishing original, scientific, high quality research articles, interesting reviews and short communications. IJCRBS publishes research articles in all areas of biological science without financial restriction to readers using the open access model of publication. Authors can submit valuable research work/ knowledge as manuscript for forthcoming issue. Articles submitted to the journal must not be under consideration for publication elsewhere. Manuscript should strictly follow the instruction to Author. 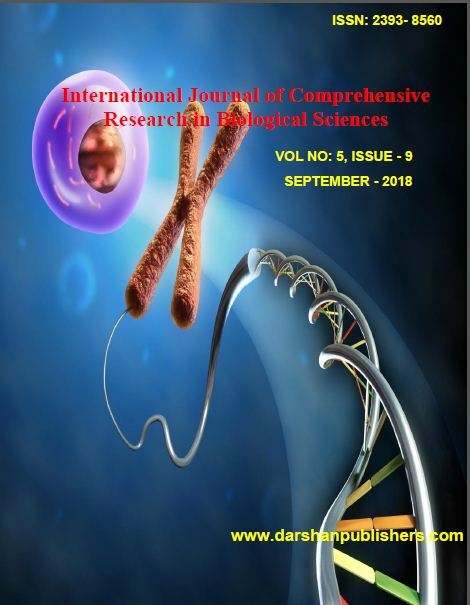 International Journal of Comprehensive Research in Biological Sciences(IJCRBS) aims to publishes various fields of biology including Life sciences, Microbiology, Biotechnology, Agricultural Sciences, Chemical Sciences, and Environmental Sciences, Botany, Plant Science, Biochemistry, Zoology, Marine Biology, Genetics, Molecular Biology, Pharmacogenomics, Pharmacology, Medicine and Dentistry, Veterinary Science, Anatomy, Nutrition and Metabolism, Cancer Research and Experimental Oncology, Clinical Pathology and Forensic, Medicine, Agricultural Engineering, Agricultural Biotechnology, Agricultural Microbiology and Plant Pathology. Authors are requested to submit Research and Review articles through online at journalijcrbs@gmail.com with mention journal title (IJCRBS) in subject line. Volume 1, Issues –2014 : January, February, March, April, May, June, July, August, September, October, November, December. Volume 2, Issues –2015 : January, February, March, April, May, June, July, August, September, October, November, December. Volume 3, Issues –2016 : January, February, March, April, May, June, July, August, September, October, November, December. Volume 5, Issues –2018 : January , February, March, April, May, June, July, August, September October, November, December.